Dottie’s Cabin is the largest cabin that sleeps up to 8 guests. 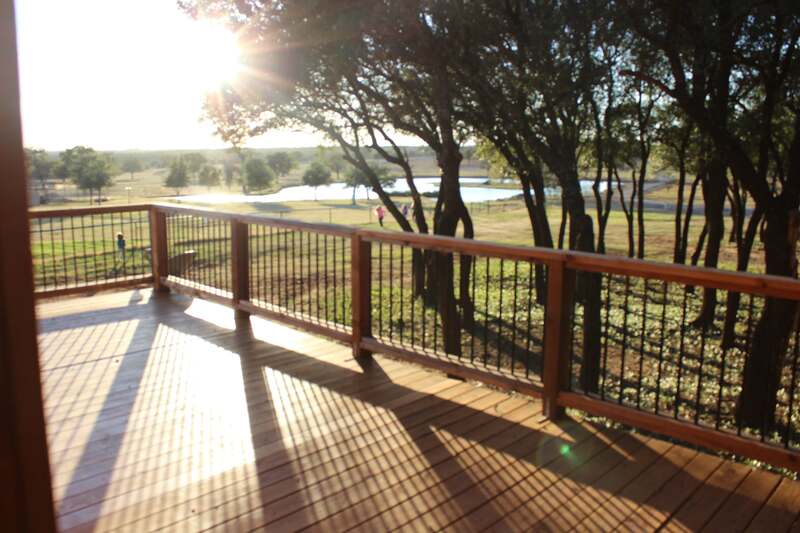 It has our largest patio deck with amazing views of the zoo and surrounding hill country. You’ll be in a huge great room equipped with two murphy beds to keep maximum space available during the day. There is also a separate room with two additional queen beds. Have a larger group? We’ve recently added a connecting 4-person cabin with an extended deck, so you can book cabin 6 & 7 together and sleep up to 12 guests! Either way, you’ll have plenty of space to kick back and enjoy the unique experience of listening to all the animals living it up on the range! Click here to book your stay today!! Cabin Rates: You can book a reservation for this 4 bed/2 bath cabin today for $200/night, which covers the accommodations and stay for up to 8 guests (and also currently includes a free tour for all staying)! Cabin includes clean linens and towels for up to (8) guests, so don’t forget to pack extra bedding and towels to help with your extra guests!